The new SmartMotion universal water block is a true all-rounder. It is suitable for all common motherboard – northbridge and southbridge - chips as well as NVIDIA® and ATI® GPU chips*. Additionally, the water block can also be used on the video chip on NVIDIA graphics cards or for other special solutions. This is made possible by the very flexible mounting system with pivoting mounting brackets. Should that not be enough, one additional mounting bracket is included to cover all mounting needs. *The compatible hole spacings and pivoting radiuses can be seen in the PDF document. The best part: the water block doesn’t have to be disassembled to replace the brackets; only a decorative plate has to be removed. For one-piece brackets a separate decorative plate is included. 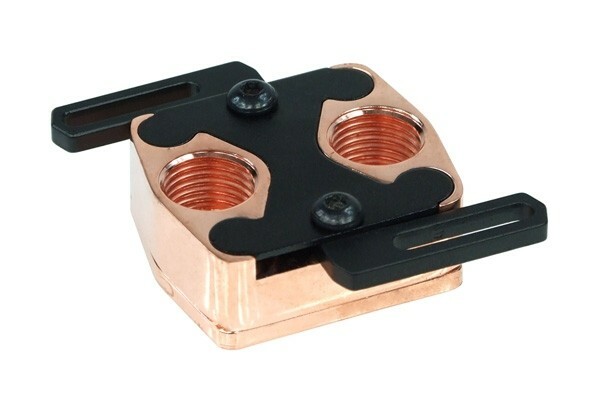 Should additional brackets be needed in the future, they can simply be ordered without having to purchase a completely new water block. The performance is also truly amazing: The milled cooling structure in the pure copper cooling plate promises great cooling performance with high flow rates of 5 liters per minute – plenty for all high-flow systems. The spacing between the G1/4” threads is 24mm from hole center to hole center, plenty for fittings with a large outer diameter. Ich kann die maximalen Befestigungsabstände nirgendwo finden. könnten sie sie mir schreiben, da ich nicht weiß ob ich diesen kühler verwenden kann. Die Maßen sind folgende. Minimaler Lochabstand: 40mm Maximaler Lochabstand: 78mm Daten werden demnächst nachgereicht.